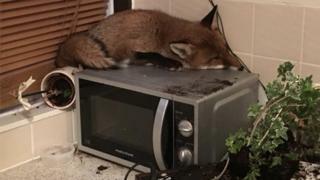 A fox was found snoozing on top of a microwave after it snuck into a south-west London home. The animal came in through the cat flap and smashed plant pots before curling up on top of the appliance. Kim Fryer, from Mitcham, called the RSPCA, after her daughter found the fox in the early hours of the morning. Mrs Fryer said she could tell “there was something wrong” with it but after being checked over by vets it was released back into the area. Ms Fryer, who has five cats and a dog, said: “She put the light on and one eye opened but he didn’t move. 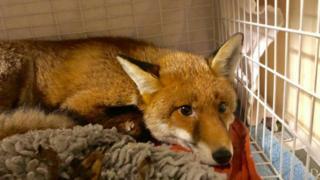 The fox was taken to Putney Animal Hospital on 15 December. The RSPCA said it expected to rescue about 10,000 animals over the winter.